Your browser does not support cascading style sheets. A portion of proceeds from sales of The Last Dance will be donated to promote the health and well-being of NH families and to protect our environment. *Saturday, September 29, 2007 @ 11:00 a.m. - 2:00 p.m.
*Saturday, October 13, 2007 @ 8:15 a.m. - 3:00 p.m.
*Friday, November 9, 2007 @ 1:00 - 4:00 p.m.
*Thursday, May 10, 2007 @ 7:00 p.m.
*Tuesday, May 22, 2007 at 7:00 p.m.
*Wednesday, May 30, 2007 @ 1:30 p.m. DIRECTIONS: Take Rte. 3 to Exit 5 towards hospital signs. Stay on Kinsley Street and turn left on Main Street. Get in right-hand lane and turn left on Temple Street. The activity center is on the left. Book Event/Author Appearance, Manchester City Library Auditorium, 405 Pine Street, Manchester, NH 03104. *June 11, 2007 @ 12:30 P.M.
*Tuesday, June 26, 2007 @ 11:45 a.m.
*Friday, April 6, 2007 at 7:00 p.m.
*Wednesday, January 31, 2007 at 5:00 p.m.
*Wednesday, Sept. 20, 2006 at 11:00 a.m.
*Wednesday, Oct. 18,2006 at 5:30 p.m.
*Saturday, Oct 28, 2006 at 10:30 a.m.
*Monday, Oct. 30, 2006 at 7:00 p.m.
St. Joseph Hospital's Main Campus is located at 172 Kinsley Street in Nashua, NH. For more information, please call (603) 882-3000. *Saturday, October 28, 2006, 10:45 a.m. Author Appearance & Book Signing, "Zonta Club District Fall Conference"
*Wednesday, May 10, 2006, 7-9 p.m.
Littleton Regional Hospital is proud to host a presentation by author Ann McLane Kuster on her book, The Last Dance, Facing Alzheimer's with Love & Laughter. The presentation will be held on Wednesday, May 10, 2006 at Littleton Regional Hospital in the H. Taylor Caswell, Jr. Physicians' Office Building in the Hospital's cafeteria. This presentation is free and open to the public. Refreshments will be served. For more information, please 603-444-9355. Author Ann McLane Kuster will present on The Last Dance for Grand Rounds from 12:00 p.m. to 1:00 p.m. in Conference Rooms 1 & 2. *Thursday, June 1, 2006 6:30 p.m.
*Thursday, June 15, 2006, 7:00 p.m.
*Thursday, Jan. 26, 2006, 6:30 p.m. Author Appearance & Book Signing. *Thursday, March 16, 2006 7:00 p.m.
*Tuesday, April 11, 2006, 12:45 p.m.
86 Old Ward Bridge Road, Plymouth, NH. Contact: Natalie Rudzinskyj, Director of Community Relations, (603) 238-6468, natalier@spearehospital.com. *Thursday, November 10 - 5:30 p.m.
*Thursday, October 13th, 7:00 p.m. Author appearance and book signing. Woodcrest Village Assisted Living, 356 Main Street, New London, NH. www.woodcrestvillage.com. Contact Kim Butler at: 603.526-2300 or at: kimpres@mcttelecom.com. The third annual festival will be held at the Winnipesaukee Expo Center from 9am to 2:30pm. The festival is sponsored by local organizations including ServiceLink of Belknap County, the Belknap County Area Committee on Aging, Community Health & Hospice, LRGHealthcare, LRGH Auxiliary, and the Taylor Community. Contact: Lisa Morris 528-6945 for more information. Ann McLane Kuster to speak. Contact Woody Woodland, (603) 487-3643. Contact Connie Jones at: 603.663.8763, or at: CJones@CMC-NH.ORG for information. Dartmouth Hitchcock Medical Center, Auditorium E, Lebanon, NH, starts at 2 p.m.
Memory Health Fair. Displays and information for people with Alzheimer's and their families and caregivers. All events are free. At 6 p.m., Robert B. Santulli, M.D., Associate Prof. of Psychiatry, Dartmouth Medical College, and Director, Upper Valley Alzheimer's Disease Resource Center, will speak on "The Challenge of Alzheimer's: Maintaining Quality of Life for Patients and Families." 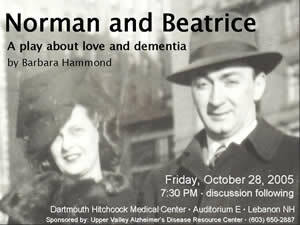 At 7:30 p.m., Norman and Beatrice: A Play about Love and Dementia by Barbara Hammond will be presented. Call (603) 650-2887 for more information. *Sunday, October 30th, 1:30 p.m. Directions: From the south, take I89 north to exit 17, left at bottom of exit ramp. Take right turn at Exxon station to second building on the left. From the north, take I89 to exit 18, right at bottom of exit ramp. Take a left on Hanover Street into Lebanon. Go past the town green and take the first left (Exxon station will be in front of you). Take the street right beside the gas station and the Senior Center is the second building on the left behind the gas station. Look for the Upper Valley Senior Center sign. Location: Easter Seals, 555 Auburn St., Manchester NH. RSVP 628-7804. Click here for PDF of invitation. *Wednesday, September 28th, 2005 at 7:00 p.m.
Ann McLane Kuster will appear at "Meet the Author" night for book signing and discussion. Contact Carol at carol.eyman@nashua.lib.nh.us, or 603-589-4600 for more information. *Saturday, October 1, 2005 - 9:00 a.m.
*Thursday, August 18th, 2005, Book signing at the Alzheimer's Education Conference. Ann will appear on the Kearsarge Valley Magazine, a local cable show airing in towns surrounding New London, with host Jim Mitchell, of Main Street Bookends of Warner. *Guest Speaker, May 9th, 7:00 p.m.
Ann McLane Kuster Live on Nitebeat-CN8, with Barry Nolan. Ann McLane Kuster and Malcolm McLane will speak on Alzheimer's at Riverwoods in Exeter, NH on May 11, 2005. Contact Riverwoods at Exeter at 800-688-9663, for more information. Visit their web site at: www.riverwoodsrc.org to learn more. This event is planned for the community members. Barnes and Noble in Manchester (1741 South Willow Street, 603-668-5557) Ann will sign copies and read a selection from The Last Dance. Ann McLane Kuster will present one workshop. Conference begins at 8:00am and concludes at 3:00pm. The workshop sessions will be held from 11:00 AM to noon and 1:45 PM to 2:45 PM. Ms. Kuster will present once. Visit their web site at: http://www.dhhs.state.nh.us/DHHS/BEAS/LIBRARY/Meeting-Event/conference+on+aging.htm Email Lia Barody at lbaroody.DHHS@dhhs.state.nh.us or call 603-271-4339 for more information. DHHS - Bureau of Elderly and Adult Services (BEAS) holds their annual Conference on Aging in May. The theme for the 2005 conference is "Challenging the Myths of Aging: Strategies for Living Well". NH Speaks, a White House Conference on Aging (WHCoA) affiliated event, will provide New Hampshire's citizens a unique opportunity to relay their concerns to the White House. The New Hampshire Bureau of Elderly and Adult Services (BEAS) and Public Service of New Hampshire are sponsoring workshops, exhibitors, and will provide lunch during the Conference. One component of the conference is to have break out/workshop sessions relative to aging and disabilities and this year, Ann McLane Kuster will be a workshop presenter. Workshop presenters will speak on a variety of subjects relative to aging well. Ann will speak about her personal experience with Alzheimer's Disease and also in a broader sense on dealing with loss in general, leaving time for questions and discussion. The Last Dance will be on sale at the event. The conference will be held on Thursday, May 26, 2005 at the Radison Hotel - Center of NH in Manchester, 700 Elm Street, Manchester, NH 03101. Last year approximately 350 people attended the conference. This year due to a location change they will be able to accommodate significantly more participants. Ann will be a guest on “Point of View” with host Dot Seybold, on Valley Vision-Community Television in North Conway, NH. The program airs at 7:30pm live and is repeated several times that week in the local area. The Tuck Library, The Historical Society of New Hampshire. Sponsored by The United Way of Merrimack County and The Alzheimer's Association of Vermont and New Hampshire. Call Nancy Mellit at The United Way of Merrimack County at 603-224-2595 for more information. This event is open to the public. Visit the Web site at www.nhhistory.org for more information. Grappone Conference Center, Concord, NH. Call 228-1231 for more information. Ann McLane Kuster, Luncheon Speaker, Noon. Contact the Alzheimer's Association at their Concord office by calling (603) 226-5868 or (800) 536-8864. Visit their Web site: www.alz.org/vtnh. This event is open to the public. Ann McLane Kuster will be speaking at the celebration about Susan's connection and long-standing ties to CFHC (Susan was an original advisory board member in 1974) and her long-term commitment to choice. We know that Susan would be proud of us and want to celebrate with us if she could! CFHC will also be selling signed copies of The Last Dance throughout the evening. Please contact; CFHC, 38 South Main Street, Concord, NH 03301 or e-mail Kudra MacCaillech at kudra.feministhealth@verizon.net or call (603) 224-3251 xt. 212 for more information. Ann will read from the book and talk with residents and their families. Malcolm McLane will also attend and be available to answer questions. Sponsored by The Alzheimer's Association of Vermont and New Hampshire and Havenwood Heritage-Heights . Call Havenwood Heritage-Heights at 1-800-457-6833 for more information. This event is a program for residents and their families. Visit the Web site at http://www.hhhinfo.com/ for more information. Gibson's Bookstore, South Main Street, Concord, NH. Call 224-0562 for more information. Visit their web site at www.gibsonsbookstore.com for more information. 33 South Main Street, Hanover, NH 03755, (800) 624-8800, (603) 643-3616. Open to the public. Contact Jan Pelver for more information. Main Street, North Conway, NH, sponsored by White Birch Books, 2568 S Main Street in North Conway. Call 603-356-3200, or visit www.whitebirchbooks.com for more information. in The Last Dance, with host Jennifer Millette. *Please join Ann and NH Audubon for a celebration of Susan's life and her dedication to conservation. Ann will give a short presentation and reading. We will also have a special guest, Ann McLane Kuster, who will be presenting and signing copies of a book she has has written with her mother, former NH Senator Susan McLane, about her family coping with her mother's progressing Alzheimer's disease, entitled, The Last Dance: Facing Alzheimer's with Love and Laughter. RiverMead Retirement Community, Peterborough, NH. Ann will read from her book and talk with residents and their families. Malcolm McLane will also attend and be available to answer questions. Sponsored by RiverMead Retirement Community and The Alzheimer's Association of Vermont and New Hampshire. For more information, please call RiverMead at 603-924-6460. This event is a program for residents and their families. Visit the Web site www.rivermead.org at for more information. Call (603) 352-8815 for more information, or visit http://www.toadbooks.com/NASApp/store/IndexJsp for more information. 16 East Main Street, Warner, NH. Call 603-456-2700 to contact Katherine Nevin, or visit www.mainstreetbookends.com/ for more information. Carlyle Place, 40 Route 101, Bedford, NH. Part of the Courville Communities. Ann McLane Kuster and Malcolm McLane will address the Alzheimer's support group at Carlyle Place in Bedford on March 28, 2005. Copies of The Last Dance will be available. This event is open to the public, and will include members and families of the Courville Communities, in Manchester, Nashua and Bedford, NH. Directions: 293 South, take the 293/101 West merge (past Macy's). At the light turn left on 101 West. Go through one set of lights (Constitution Drive). The Bedford Village Inn will be on the right. Driveway to Carlyle Place is on the left, directly across from the Bedford Village Inn. Ann McLane Kuster will speak on Alzheimer's at a location TBD on April 18, 2005. Contact the Women's Lecture Series at 433-6976, or Nancy Notis, Women's Health and Public Affairs at PRH for more information. Visit their web site at: www.portsmouthhospital.com to learn more. Anne will arrive and speak at 8:30a.m. Ann McLane Kuster will speak on volunteerism to PSNH employees at CR Sparks restaurant in Bedford on April 21, 2005. PSNH will distribute copies of The Last Dance to the attendees. This event is open only to PSNH employees. Book signing is at 2:00 pm. Dartmouth Medical School "Memory Health Fair" presented by the Upper Valley Alzheimer's Disease Resource Center Level 4 of the Doctor's Building at Dartmouth Hitchcock Medical Center, Lebanon, NH Free and open to the public.